Last week provided some of the lumber price answers many have been seeking for the past few weeks. That significant players had expected prices to soften by now was immaterial as trading of softwood lumber futures on the Chicago Mercantile Exchange crested up-limit twice this week, to close Thursday at US$536. The latest data out of Statistics Canada, for full-year 2016, demonstrates real support for strong lumber prices. The value added of the Canadian forestry, lumber, and pulp and paper industries, as defined by the Softwood Lumber Satellite Account (SLSA), exceeds $20 billion and increased from 2013 to 2016, said StatsCan March 30. “The softwood lumber industry remains an important industry, accounting for an average of 1.2% of total Canadian economic activity and over 5% of total Canadian exports over this period. The value added to output ratio remained relatively stable over this period at about 33%,” detailed StatsCan. 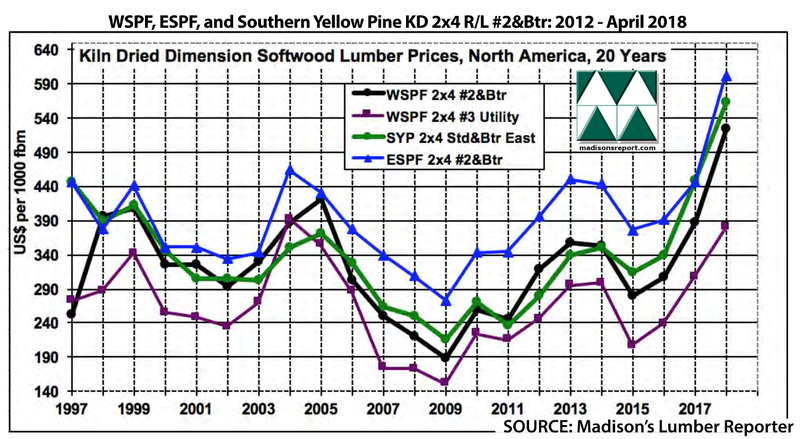 The above table is a comparison of June 2017 and April 2018 prices for benchmark dimension softwood lumber 2×4 prices compared to historical highs of 2004/05. According to the latest data from Statistics Canada, released March 30, Net trade of forestry-related products averaged about $20 billion annually from 2013 to 2016. Exports of forestry-related products accounted for over 5% of the total value of Canadian exports over this period. Exports were led by softwood lumber (from $7.4 billion in 2013 to $9.9 billion in 2016), sulphate softwood pulp (from $4.5 billion in 2013 to $4.9 billion in 2016), and paper (from $3.4 billion in 2013 to $3.3 billion in 2016). Exports of forestry, lumber and pulp and paper products are significant in British Columbia, accounting for 24% of total exports in 2016. SLSA products are also important exports for New Brunswick (15%), Quebec (9%) and Nova Scotia (9%). International exports rose strongly over the period, with gains in most provinces. The provincial distribution highlights the clear concentration of the exports originating in Quebec, Ontario and British Columbia (accounting for 82% of all exports in 2016).